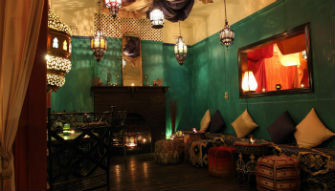 Morocco Lounge (First Floor) is an ideal engagement party venue with a capacity of 60 – 114 guests, service tailored to your requirements and in a excellent location!. It is a stunning events space adorned in rich Arabesque tapestries, large ornate mirrors and antique lanterns from Morocco which dapple the walls with intricate patterns. 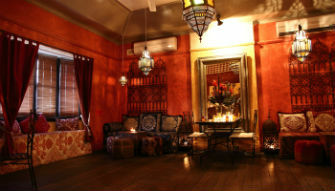 Large luxurious daybeds, a private bar and private dance floor make this an impressive setting for any special event. The venue offers ample seating, for those who want to sit and relax, as well as the perfect dance floor area! Limited available (Greville, St, Izett St, Gratten St) free and unlimited time (after 6pm until 10/11am the following morning). Coles/Safeway Carpark along Izett St; Ample available, Ticketed 24 hours a day (and regularly checked); Can park there as long as you like as long as you have purchased a ticket. $1.40 per hour for the first two hours, $2.20 per hour after the first 2 hours. The Morocco lounge the larger of our 2 venue spaces, It is all one single large space but is designed in a way that gives not only a huge open space but also little areas where people can sit and relax. This space is ideally suited to 60 to 114 guests and has its own private bar, DVD player and LCD screen, sound system, couches and tables and loads of room to dance. We host all types of events (except 18th birthday parties), so whether it's a corporate function that you have, a product launch, the 40th birthday party, or a bar mitzvah we have done it all. Having hosted over 2000 events, we are highly experienced, very professional and super organised. We do not cater for sit-down dinners, however for that reason, we have developed fantastic stand-up canapé options, and have particular packages designed as lunch or dinner replacements. Past corporate clients have described the style as ‘Standing Degustation’. The concept works extremely well, giving guests the flexibility to mingle freely. The venue still offers ample seating, for those who want to sit and relax, as well as the perfect dance floor area! We are available for hire 7 days a week from 9am – 1 am. Call us today on 0419 902 920 to discuss what we have available. We pride ourselves on being able to create events that you will remember. We have a wide variety of entertainers so if you have something in mind then chances are we know somebody who is great. Another the reason why it's worth considering booking your entertainment through us is that because we are a preferred supplier, we can often provide the entertainment at a significantly cheaper price than you could source yourself. Best of all, if there is something that you want we can usually find it for you so it takes all the hassle out of figuring out how to make your event memorable. Had an absolutely amazing time at Mofo Lounge last night for my girlfriends hens night. Perfect venue and perfect location. Amazing staff, so accommodating!